An environmental group working with Albany South End residents is urging the federal government to step in over concerns that a proposed state air-testing plan for the Port of Albany is too weak. The state Department of Environmental Conservation is planning tests next month for potential air pollution from an influx of crude oil trains discharging oil at the port, but a lawyer for EarthJustice, a New York City environmental advocacy group, is asking theU.S. Environmental Protection Agency to help support a more comprehensive air study. "What DEC is proposing is not robust enough," said EarthJustice lawyer Chris Amato, a former DEC commissioner for natural resources from 2007 to 2011. He wrote a letter Tuesday seeking help from EPA Regional Administrator Judith Enck. He said DEC plans call for four temporary air-testing stations around the port, and that each will collect four one-hour air samples to be analyzed for volatile organic compounds (VOC), a kind of vapor than can be formed from petroleum and other petrochemicals. In some forms, VOCs are known carcinogens. VOCs increase with rising temperatures, and "we have serious concerns whether May will be the month when potential VOC levels would be at their highest," Amato said Wednesday. Also, he said, the state testing stations will not measure other petrochemical vapors, like polycyclic aromatic hydrocarbons (PAH), or sulfur compounds. Breathing PAHs and skin contact seem to be associated with cancer in humans, according to the EPA. Sulfur compounds can cause respiratory ailments. In the last two years, the port has turned into a major shipping point for crude oil carried by massive trains coming from the Bakken oil fields of North Dakota. 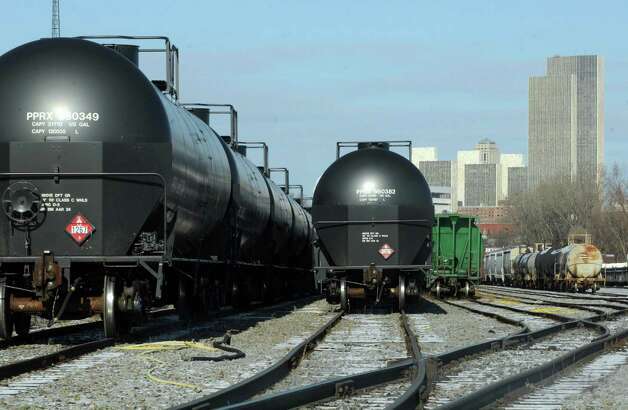 Crude oil is pumped out of rail tankers onto barges or ships for shipment down the Hudson River or continues south on trains along the west side of the river to coastal refineries. "We only just received the letter, but we certainly recognize that there has been a substantial increase in the transportation of crude oil into the Port of Albany," said Enck spokeswomanMary Mears. "The EPA will take a careful look at this request and will work closely with the state to address concerns about potential air pollution that impacts ... the Capital District." DEC spokeswoman Emily DeSantis said Amato's letter was "misguided and premature as the air screen monitoring program has not been finalized. DEC is working with the community to develop an air screen program for the South End. When the plan is finalized with the community, we will share it with EarthJustice and other interested stakeholders." She added after DEC has "results of this first step," the agency will "work with the community to determine the appropriate next steps that could include further air monitoring." Amato said that in meetings with the DEC, officials claimed the agency does not have funding or staffing to conduct a more lengthy and rigorous air test at Albany's port. And, he noted, when DEC in November 2012 approved expanded crude oil shipments into the port it did not require air tests to show what potential pollution might have been before the surge in shipments, so results from tests planned now cannot be compared to anything earlier to assess potential changes over time. Global Companies, which runs one of the port's two oil terminals, got DEC permission to double its crude imports to 1.8 billion gallons annually and is now seeking a state air pollution permit for a facility to heat crude oil to make it easier to pump from rail cars before it is shipped downriver on barges. Another company, Buckeye Partners, has state approval to handle 1 billion gallons of crude annually. Amato and other opponents are concerned that Global may be planning to accept Canadian tar sands crude, which is thicker than Bakken crude and must be heated in cold weather in order to be pumped. Global has neither confirmed nor denied any potential plans for tar sands crude. In both cases, DEC found that Global's expanded crude imports and crude heating facility project would have no negative impact on the environment, and decided that a detailed environmental study, including air pollution studies, was not required. EPA has helped the state pay for air pollution studies in the past. In 2007, EPA provided $300,000 to match $300,000 from DEC to support a yearlong air study around a petrochemical coke plant near Buffalo. That study found excessive levels of air pollution from the plant; last month, Tonawanda Coke Corporation was sentenced in federal court to pay a $12.5 million penalty and $12.2 million in community service payments for criminal violations of the Clean Air Act and the Resource Conservation and Recovery Act. The company's environmental compliance officer was also sentenced to a year in prison on obstruction of justice and other charges.